My mom gave me another obituary; she has quite a few in her possession. There is no citation. This is for Nicholas Bausman Jr, son of Nicholas Sr. and Mary (Casper) Bausman. He was married to Catherine Hebenstreit. I’m not including a newspaper image. It’s a bit long and I didn’t feel like manipulating the image into multiple columns. Nicholas Bausman was born on December 2, 1855 at Scales Mound, Ill. 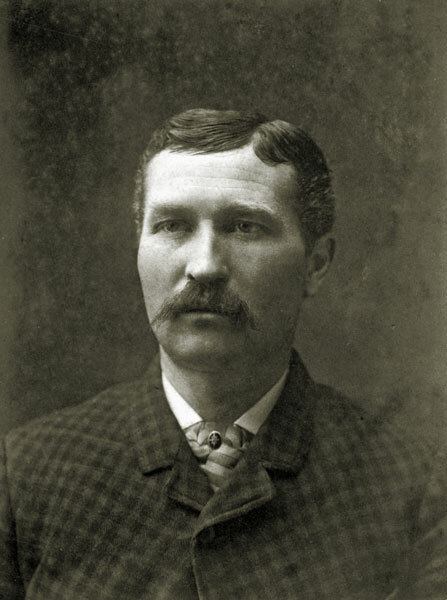 He was married to Katie Habenstreit [sic] of Shullsburg, Wis., on Jan. 21, 1886. He died on Jan. 12, 1922, at 10:15 in the morning, reaching the age of 66 years, 1 month and 9 days. Mr. Bausman lived in or near Scales Mound, Ill., all of his life except for five years when he lived at Butte City, Mont. He was a man of pleasant disposition and a good neighbor. He leaves to mourn his death, his wife and four daughters, Mrs. Lester Schoenhard of Galena, Ill., Mrs. Percy Davies [sic], Mrs. John Hesselbacher Jr., and Miss Hazel of Scales Mound. His only son, Clarence died in infancy. Three brothers, George of Warren, Ill., Lawrence of Wellsburg, Ia., and Louis of Kassen, Minn. Eleven grandchildren and a host of friends. The funeral was held from the home to the Presbyterian church at 1:30 Saturday afternoon. Rev. H. A. Sinning preached the sermon and was assisted in the service by a quartette of singers, namely, Mr. and Mrs. Adam Rittweger, Mr. J.V. Schoenhard and Miss Lucille Baus. Mrs. Ray Colin presided at the piano. The relatives and friends from near and far to attend the solemn service were many. Some noticed at the funeral were Mr. Bausman’s brother, George, wife, their son John L. and wife and Mr. Elmer Pausing of Warren. Another brother Mr. L.L. Bausman, wife and son Lynn, of Wellsburg, Iowa, and the other brother, Mr. Louis Bausman of Kasen, Minn., Mrs. Lizzie Steinmetz of Chicago, Mr. and Mrs. Andrew Hebenestreit, Mrs. Cecelia Stephan and Mr. Andrew Hebenstreit, Jr. of Shullsburg, Wis. Mr J.V. Zawvar, Mr. J.A. Stephan of Freeport, Mrs. J.C. Varing of Cuba City, Mr. and Mrs. R.V. Stephan and Mr. Frank Hart of Galena; Mrs. C.W. Banworth and son Elizabeth. The floral offerings were many beautiful and mutely testified to the popularity and sorrow experienced by a large circle of friends in the sudden taking away of a greatly respected citizen before many knew of his serious illness. It is a warning friends we should all be prepared for coming of the Ruler that makes no mistakes. For we know not the day or hour that the summons will come to us and it behooves all to be up and doing what we can for the Master and His cause. Mr. Bausman was laid to rest in Scales Mound cemetery. Rev. Sinning conducted the burial service at the graveside. Messrs Ferd Neuschwanger, Simon Distler, George Rittweger, J.W. Baus, Joseph H. Baus and P.R. Stadel, many years genuine friends of the departed casket bearers.